Middle east oil pipelines under construction or to begin construction in the near future. 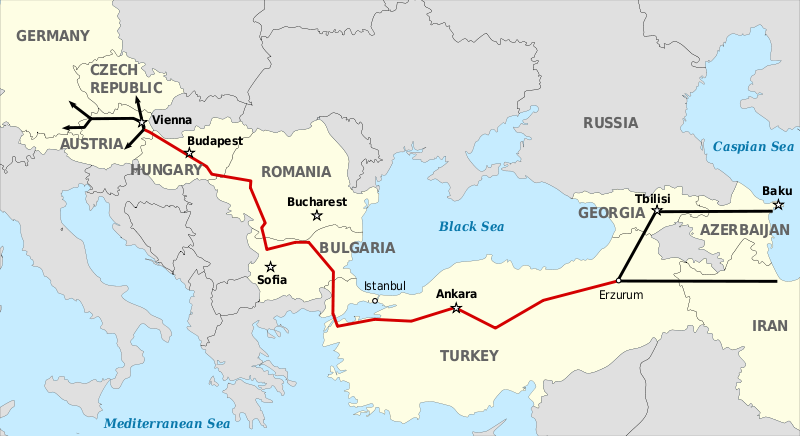 Considering that some parties – including Russia and China – may consider tying currency to oil, these pipelines, the oil beneath the Caspian Sea and who owns it are even more interesting subjects. BRIC countries (Brazil, Russia, India and China), let me introduce BRIC-plus-1 and rename it CRIBS, (adding South Africa) is already looking to create the next largest world currency — one that will be pegged to oil. This will be an extreme threat to the dollar, because trading oil in dollars is one thing that gives that currency much of its value. “Follow the money” is always good advice. 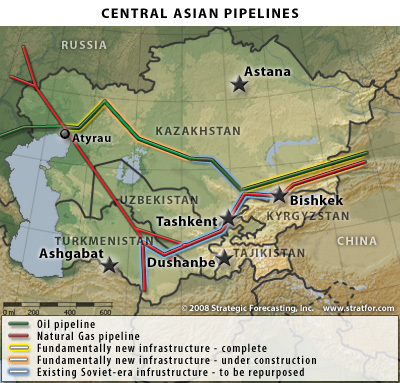 Money / power / control… lots to be had in and around the Caspian Sea. It’s not only Middle Eastern nuclear power (weaponry) they’re interested in controlling. According to estimates, the southern part of the Caspian Sea holds at least 32 billion barrels of oil reserves. 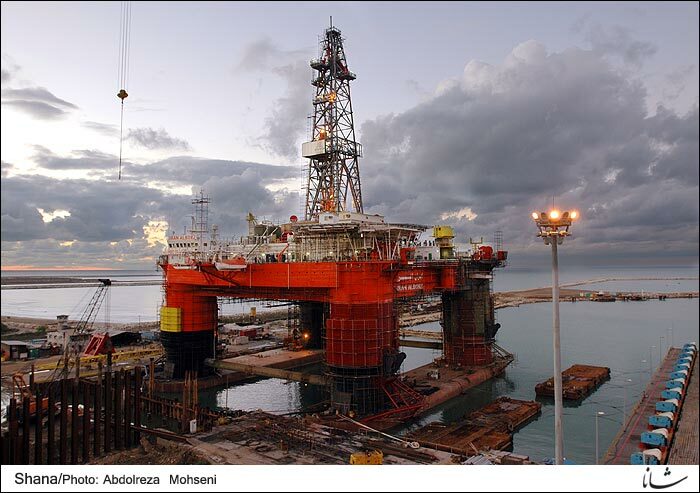 Photo caption: Recently launched Iran-Alborz oil exploration platform in the Caspian Sea. The Iranian Privatization Organization has been given the rights to privatize 80 percent of the rights to explore oil in the country’s northern sector and the Caspian Sea. As Obama mulls sanctions over Iran’s nuclear program, he meets Turkey’s Prime Minister Recep Tayyip Erdogan at the White House today. Ankara’s rising economic ties with Tehran could undercut sanctions. As international concern grows over Iran’s nuclear ambitions, President Obama will on Monday seek to engage Turkey – a rising power in Mideast diplomacy and member of the United Nations Security Council – in the West’s effort to prevent the Islamic Republic from developing nuclear weapons. TEHRAN (FNA)- Secretary of Iran’s Supreme National Security Council (SNSC) Saeed Jalili discussed different issues of mutual interest and also the regional and international developments with Turkish Prime Minister Recep Tayyip Erdogan. During the meeting, Jalili called for effective cooperation among regional nations to pave the way for confronting the world big powers. Here are two articles about Iran’s nuclear activities that I came across today. … UN agency completing a nuclear test detection station in Turkmenistan, just a few kilometers from the Iranian border. The PS44 installation is the 337th facility of the International Monitoring System. 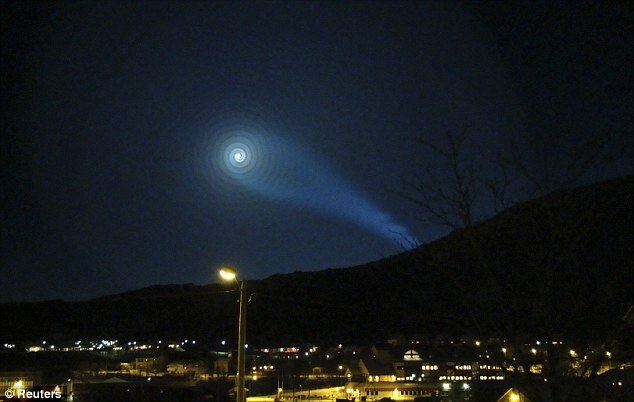 It was set up by the Comprehensive Test-Ban Treaty Organization (CTBTO), a network of stations across the globe that monitors the atmosphere to detect nuclear blasts by countries secretly testing nuclear weapons. PS44 is expected to be operational by 2010, once it has been tested. German intelligence reports that Iranian scientists have successfully simulated the detonation of a nuclear warhead in laboratory conditions, in an effort to sidestep an underground nuclear test like the one that brought the world down on North Korea’s head earlier this year. DEBKAfile’s Iranian and intelligence sources report that this development is alarming because detonation is one of the most difficult technological challenges in the development of a nuclear weapon. Mastering it carries Iran past one of the last major obstacles confronting its program for the manufacture of a nuclear warhead. … No, Iran has not yet produced the 35 pounds of highly enriched uranium required to fuel a bomb at its well-known, well-inspected facility in Natanz. But there are probably additional hidden facilities like the one near Qom. As a U.S. senior intelligence official told Sanger years before that facility came to light: “None of us believe they will create weapons-grade fuel at Natanz. What they are producing at Natanz is a body of knowledge there that they can transfer elsewhere.” It turns out this was correct. … In the real world, it is unlikely that Israel will wait months and months for this latest initiative to succeed, or more likely fail. Therefore, the world should prepare for a high-risk Israeli military attack on Iran’s suspected nuclear weapons facilities, catalyzing a wave of further instability in an already volatile region. Iran has so far installed 7,000 centrifuges at its uranium enrichment site in Natanz and 25,000 centrifuges are in the preliminary phases of installation. Planning has also been done for the production of more than 52,000 centrifuges and these centrifuges are now under production inside the country.